The Vitro X range offers high quality coffee shop style drinks at a the touch of a button. The Vitro X range brings to the customer an authentic espresso coffee with the option to further improve the extensive menu with freshly brewed leaf tea based drinks. This state-of-the-art machine has outstanding design has been developed to simplify the use and enhance the consumer experience. The RGB mood lighting can be adapted to any environment whilst attracting the customer attention. The Vitro X3 Espresso incorporates high pressure espresso technology providing authentic Italian style beverages. The machine attracts the customers attention and enhances the user experience at every point. 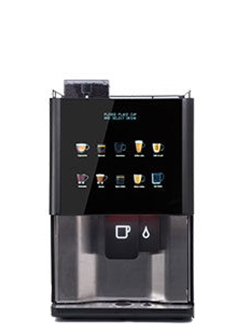 The Vitro X3 Espresso Duo incorporates high pressure espresso technology and a fresh leaf tea brewing system. A complete menu of coffee shop style drinks are available among with freshly brewed tea. 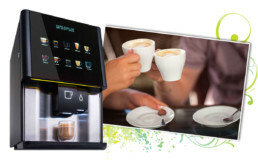 The Vitro X4 Espresso includes everything you would find from in the Vitro X3 Espresso, genuine espresso coffee based coffee menu, with a Free Standing machine capacity and option of incorporating an attractive Media Screen. 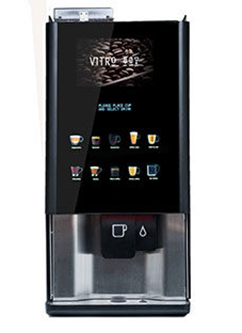 The Vitro X4 Espresso duo provides genuine high pressure espresso coffee, fresh leaf tea, chocolate & milk based drinks. The machine has a large product capacity and includes as an option a Media Screen.